Leisure Arts back issue crafts magazine volume 6, number 3 April 1992. 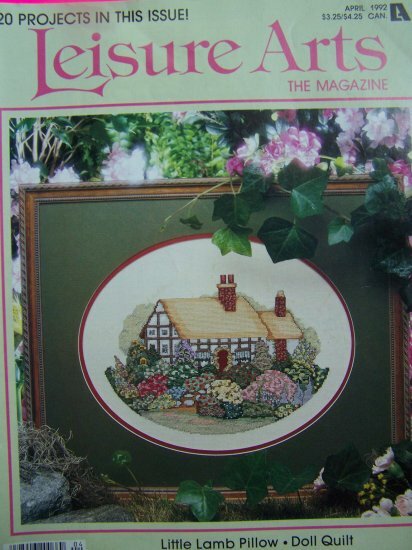 This cross stitch magazine has 35 pages and is 11" x 8 1/2". Contains 20 lovely designs. Cross stitch, knitting, crochet and quilting. Cute patterns in the book: Jelly bean bunny, English cottage, Country Cats, Towel edgings, Stitch a mugs bunnies, Doll quilt, Spring shirts, Knit and crochet Baby booties Mary jane, peep toe, Baby toy little lamb, Table linen, Bookmarks. S & H to the USA : $2.25. >> Over 9000 vintage sewing patterns, vintage crocheting, knitting, plastic canvas patterns, vintage fabric, discontinued tapestries in stock!